Our firm’s founder, Harold T. Spitznagel, gave shape to spaces where people lived, learned, worshiped, worked, played, and healed. “Spitz” dedicated himself to understanding his clients and their needs. He was a consummate marketer who knew all the businessmen in town, had the ear of decision-makers in government, and counted plenty of friends on college campuses. 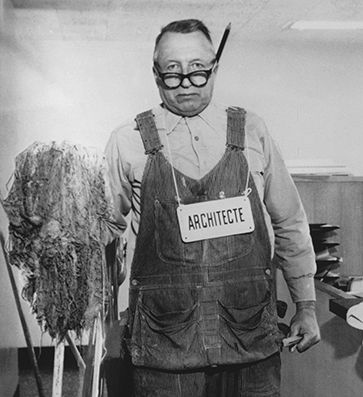 Together, they created some of the most enduring designs in South Dakota and the surrounding states. 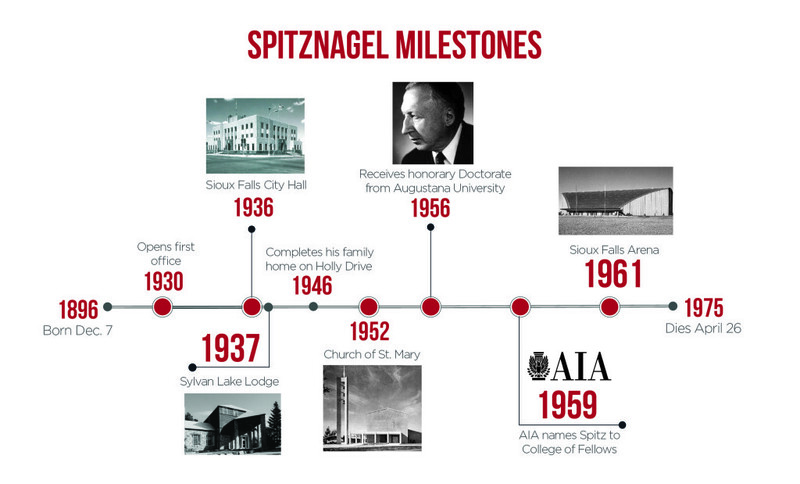 Here, we offer a partial listing of Spitznagel’s personal work as well as the projects designed under his leadership. He retired in June 1972 — 42 years to the month after opening his practice. 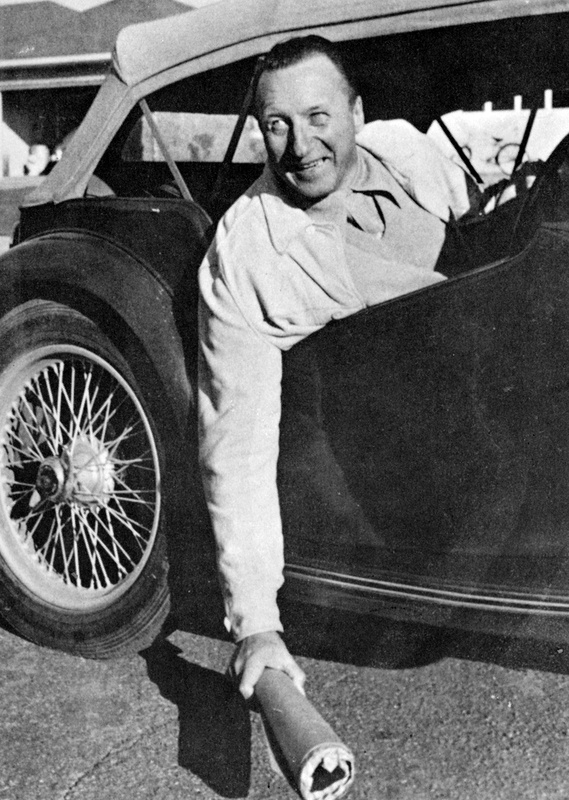 Spitz died in 1975 and in 2006 was inducted into the South Dakota Hall of Fame. June 9, 1930: Spitz establishes his practice in Sioux Falls, as Harold Spitznagel, Architect. His first job is remodeling the front of a bakery, and he takes his fee in the form of baked goods. 1931: E.C. Main residence in Riverview Heights neighborhood, Sioux Falls. 1932: Swimming pool for John Morrell Foster, owner of the meatpacking plant. 1932-34: John Morrell Foster residence, a two-story home. 1932: Wayne Donahue residence, Sioux Falls. 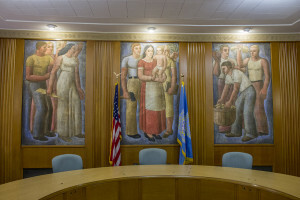 1937: Completes Custer State Park Museum, constructed with federal funds and CCC (Civilian Conservations Corps) labor as part of the New Deal recovery efforts. Renamed in 1979 as the Peter Norbeck Visitor Center. 1935: Henry Bailin residence, Sioux Falls. 1935: C.F. Schneider residence, Sioux Falls. 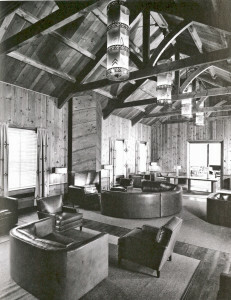 1936-1937: Spitznagel and partner John Schoening design Sylvan Lake Lodge, a departure from the usual “peeled logs” rustic style. Nevertheless, the structure blends into its forested surroundings. Local stone exterior with singled siding laid in a zigzag pattern. Interior knotty pine, leather furniture, and open trusses in the main lounge with its plank floors and historical references through the use of Native American motifs. Relief sculpture by Palmer Eide. The commission helps establish Spitznagel as a prominent professional. 1936: Ruth and B. Harietta Bach residence, Sioux Falls. 1936: George Rice residence, Flandreau. 1936: Lyle Olson residence, Sioux Falls. 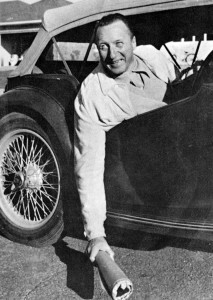 1936: Dr. C.P. Schneider residence, Sioux Falls. 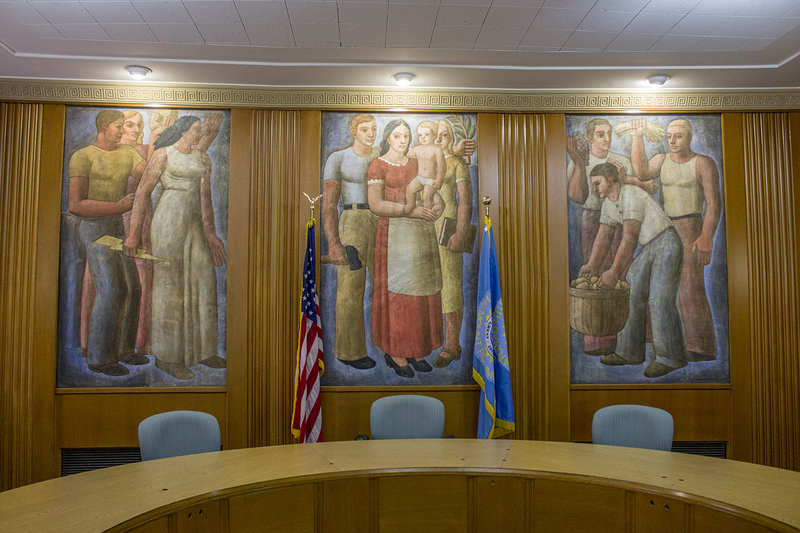 1936: City Hall is completed, with frescoes by Edwin Boyd Johnson in the Commission Room. The project marks the first artwork included as part of a Spitznagel design. Additional works include granite carvings over the entrances and limestone plaques above the windows. 1937: Henry Bailin residence, Sioux Falls. 1937: George Hult residence, Sioux Falls. 1937: Dr. S.A. Donahoe residence, Sioux Falls. 1937: R.W. Bailey residence, Sioux Falls. 1937: P.R. Billingsley residence, Sioux Falls (Spitz would design a second residence for Billingsley in 1950). 1937: Remodel of KSOO radio studio, Sioux Falls. 1937: Grade School, Ellsworth, MN. 1938: Russell Cole’s department store, Brookings. 1938: Dr. W.A. Dawley’s clinic, Rapid City. 1938: William B. Thomas apartment building, Sioux Falls. 1938: Homer L. Caplan residence, Sioux Falls. 1938: F.P. Hall residence, Sioux Falls. 1938: Sam C. Fantle, Jr. residence, Sioux Falls. 1938: Max Rysdon residence, Sioux Falls. 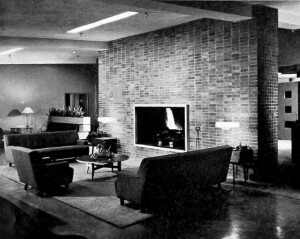 1938: Dean Serles residence, Brookings. 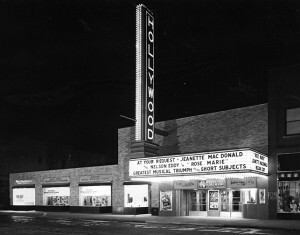 1939: Hollywood Theater, Spitz’s only movie house, opens in downtown Sioux Falls. L.D. Miller and Joe L. Floyd. 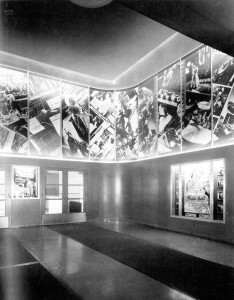 Self-rising seats, a towering marquee, an indoor ticket vestibule, and a photographic panorama of film images above the lobby. A curving staircase and the novelty of fluorescent light fixtures add to the building’s character. 1939: Irving School completed at 11th Street and Spring Avenue, Sioux Falls. The two-story building discarded the neoclassical-revival theme prominent in institutional designs and instead used a patterned tan brick, large windows for natural light in classrooms, and streamlined moderne touches (use of glass block framing doorways, sleek stairways molded in terrazzo). One-story wing on building’s south end housed a library and administrative office. 1939: T.M. Bailey residence, Sioux Falls. 1939: E.W. Stephens residence, Pierre. 1939: Dr. Ray Lemley residence, Rapid City. 1939: John Morrell Foster’s guest house, on an estate south of Sioux Falls overlooking the Big Sioux River. 1940: W.R. Laird and F.P. Hall Apartment Building, Sioux Falls. Pink brick-clad structure in a modified Colonial Revival style. 1940: History Club building, Sioux Falls. 1940: G.M. Maris residence, Sioux City, IA. 1940: John Morrell & Co. Visitors Building. Small brick-and-tile building with a photographic panorama depicting various images of meat processing and food prep, situated around a horseshoe-shaped auditorium (not unlike the arguably more glamorous photographic mural inside the Hollywood Theatre’s lobby). 1940: New cell block for South Dakota State Penitentiary, Sioux Falls. It’s the firm’s largest project of the year. 1940: Sport Bowl bowling alley, bar, and restaurant on North Phillips Avenue, adjacent to Hollywood Theatre in downtown Sioux Falls. Street-level portion of façade clad in smooth porcelain-enameled steel panes that surround large windows and flank a recessed entry. Upper portion consists of five overlapping horizontal aluminum panels (each panel made up of vertical strips). Prominent neon letters mounted atop the aluminum panels. 1940: Extensive remodeling of façade and interior of Carpenter Hotel, a landmark property on Phillips Avenue in downtown Sioux Falls, owned by the Eppley Hotel Company. Gently curving wood and plaster, with a striped tile floor and vertical fluorescent lighting. 1940-1941: Fenn Brothers Candy Company office, Sioux Falls. 1941: John Morrell & Co. office building, Sioux Falls. 1941: Extensive alterations to Behrens Building (National Bank of South Dakota), originally designed by Weary and Alford of Chicago and built by Pike and cook of Minneapolis in 1917. At time of construction, it was tallest structure in downtown Sioux Falls. 1941: Mrs. Frank Baysere residence, Sioux Falls. 1941: H. (Harold) Levinger residence, Yankton. 1941: David W. Jewett residence, Sioux Falls. 1941: Dr. B.O. Mork, Jr. residence, Worthington, MN. 1941: Central Electric and Telephone Company office, at Dakota Avenue and 10th Street in downtown Sioux Falls. 1942: World War II causes a shift in homeland efforts. Spitznagel becomes director of housing for the Sioux Falls Army Air Field and its radio operator school. Firm remodels a former car dealership for the United Services Organization (USO). 1942-1945: Spitznagel’s firm secures military contracts to design housing at bases in Sioux Falls, Rapid City, Edgemont, and Custer, among other defense projects. 1945: First project at Augustana University, Sioux Falls. Campus plan for expansion that called for Old Main to be remodeled for administrative offices, East Hall to be altered from a women’s dormitory to a men’s dorm, two new wings to be added to the administration building for classrooms and laboratories, and a new women’s dorm to be constructed. Only the new women’s dorm ever would become reality, in 1949. 1945: Calvary Episcopal Cathedral remodel, Sioux Falls. 1945: Union Savings Bank remodel and vault, Sioux Falls. 1945: Johnson’s Furniture Store, created with a remodel of an old one-story building on Main Avenue. Original structure is widened and deepened, and a second story is added. Façade features large show windows and a central entrance framed in green marble beneath a recessed steel-and-aluminum marquee. Rest of building’s front is faced in tan brick with a vertical, theater-style sign. 1945: D.W. Sutherland residence, Sioux Falls. 1946: Sears, Roebuck & Co., Rapid City. 1946: Graff Motor Supply Co. office alterations and remodeling, Sioux Falls. 1946: Spitz completes his family’s home at 1209 Holly Drive in Sioux Falls. 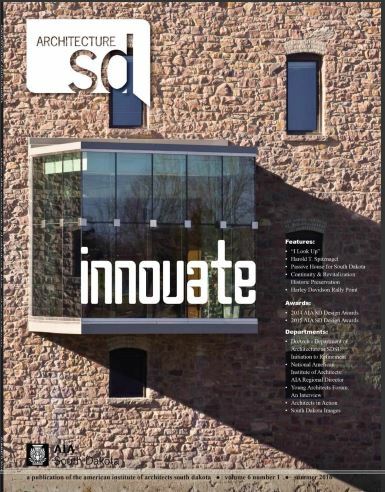 Featured in July issue of Popular Home to showcase new building methods and materials. The 1,904 sf ranch-style “Research Home” is held up as a model of the future for decades to come. Built-ins galore, double garage, large picture window on a hilltop site. Post-war building materials and appliances, many manufactured by the United States Gypsum Company. Exterior of brick and vertical redwood siding. Better Homes and Gardens magazine publishes the home’s floor plan as one of its Five-Star Plans. Plan sets are sold at $20 each, and Spitz gets a royalty of 10% per set. About 170 sets are sold. 1946: Toller Drug Company, Sioux City, IA. Spitznagel celebrated the commission by throwing jellybeans in the air at the office . 1946: Barkalow’s candy and tobacco store, corner of Ninth Street and Phillips Avenue in downtown Sioux Falls. Store occupies ground floor of an old office building whose upper four floors had been chopped off, leaving a two-story structure. Exterior recalls the Sport Bowl: Façade is clad with interlocking vertical aluminum strips that contrast with the ashlar Sioux quartzite of the second story. Deeply recessed entrance with large windows to generate interest as foot traffic passed by. 1946: Trinity Lutheran Church, Rapid City. Seating for 500, with a basement dining room/kitchen that seats 300. Exposed, laminated wood arches support the root, with bar joints and a concrete slab for the first floor. Stone sculpture by Palmer Eide. Roughly 20 years later, congregation members would help organize the effort to create the Chapel in the Hills, a replica of Norway’s Borgund Stavkirke that stands southwest of Canyon Lake. 1946-1949: Joe Foss Building, part of the state Capitol complex, Pierre. 1947: John Morrell Foster residence, Ottumwa, IA. 1947: George M. Scudder residence, Sioux Falls. 1947: B.A. LaDoux residence, Spirit Lake, IA. 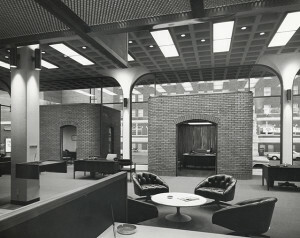 1947: John Morrell & Co. office building addition and alteration, Sioux Falls. 1947: Garrott Candy Company (Bremer Arcade) completed, Minneapolis, MN. 1947 and 1949: E.C. Olson Clothing Company remodels, Sioux Falls. 1947: Cataract Hotel remodel, downtown Sioux Falls. Replaced the lobby’s old tile floor, ornate light fixtures, and beamed ceiling. Project also created a moderne style bar from an adjacent property that originally had been a band. Rounded edges, chrome stools, and a chevron pattern on the floor. 1948: Russell D. Cole residence, Brookings. Featured in the March 1952 edition of Better Homes & Gardens Landscape design by Franz Lipp of Chicago. Rambling one-story house with a large double garage and nine-paned picture window that all in all anticipated the 1950s suburban Populuxe styles. 1948: Laverne Hubbard residence, Watertown. 1948: R.E. Hubbard residence, Watertown. 1948: H.W. Ortman residence, Canistota. 1948: J.J. McNally residence, Sibley, IA. 1948: Paul A. Weber residence, Sioux Falls. 1948: R.T. Foster residence additions and alterations, Sioux Falls. 1948: Eide Implement Company Garage, Flandreau. 1948: Dakota Farm Equipment building, Sioux Falls. 1948: Commission to design an isolation and segregation facility for South Dakota State Penitentiary, Sioux Falls. 1948-1950: Commission, construction, and completion of Ottumwa County Club, IA. Set into a shallow hillside, the lower floor’s exterior was clad in brick and the upper, in vertical redwood siding stained a driftwood gray. Screen porch on rear overlooks the golf course. Square clerestory windows highlight the indoor entry and reception areas. The club house was sprinklered for fire protection—in advance of the code requirement of later years. 1949: Whetstone Valley Electric Association Building, Milbank. 1949: Northwest Auto Bank, Sioux Falls. 1949: Belle Fourche Elementary School, Belle Fourche. 1949: Garrott Candy Co. alterations and lighting, Minneapolis, MN. 1949: Completes Tuve Hall, a new women’s dormitory at Augustana University in Sioux Falls, with interior furnishings by faculty member and artist Palmer Eide. 1950: St. Mary Parish Parochial School, Sioux Falls. First unit of a convent group. Structural steel frame with brick facing and lightweight concrete block backup. Building radiant heated with coils in the butterfly roof of bar joist construction. Ventilation was provided by exhausting tempered fresh air fed from the corridor, which serves as plenum. A fan built into cabinetwork at the exterior wall line served as the exhaust. 1950: Leville Seeley store remodel, Rapid City. 1950: P.R. Billingsley residence, Sioux Falls. 1950: Henry Billion residence, Sioux Falls. 1950: A.E. Godfrey residence, Sioux Falls. 1950: Trinity Lutheran Parish House, Madison. 1950-1952: Commission, construction, and completion of Huron Arena. Mix of temporary, roll-out bleachers on main floor and permanent seating in the balcony (3,800) could hold a combined 6,800 people, depending on configuration. Tangent arches eliminated the need for columns or trusses and offered unrestricted sightlines. Dedicated in 1952 and stood as the state’s largest such structure until the Sioux Falls Arena opened in 1961. 1951: YWCA, downtown Sioux Falls. Spitznagel’s firm later completes an addition to include the swimming pool. 1951: St. Michael’s Catholic Church, Clark. 1951: St. Mary Parish Gymnasium, Sioux Falls. 1951: Robert G. and Genevieve May residence, Sioux Falls. Purchased in 1987 by Dr. Peter and Marv Looby, who still own it today. 1951: Tri-State Mutual Grain Dealers Fire Insurance Company Building, Luverne, MN. 1951ish: Robert Lusk vacation cabin, near Keystone, published in an edition of Better Homes & Gardens magazine as a Five-Star Home. The magazine sells about 150 sets of plans, providing a 10% commission on each set sold. 1952: Curtis Companies, Clinton, IA. 1952: First project at South Dakota State University, Brookings. Harding Hall, named for Albert S. Harding, a former professor and head of the history department. He also was a SDSU alumnus, class of 1892, and considered one of SDSU’s greatest educators. 1952: Commission for Mikkelsen Library at Augustana University in Sioux Falls, completed 1955. Three-store building built partially into a shallow slope near campus center. Reinforced concrete frame face in brick with a stone-and-concrete colonnade sheltering the front entrance. Stands adjacent to a stone sculpture of Moses by Ogden Dalrymple of the art department faculty. Two stone relief panels (“Creatures of Creation”) carved by Dalrymple and fellow faculty Palmer Eide adorn the façade. North side of the building contains a two-story curtain wall with large windows and aluminum panel infills. 1952-1953: Construction and completion of firm’s new, two-story office building, at 26th Street and Summit Avenue in Sioux Falls. Second floor sheathed in gray-stained vertical redwood planking; ground floor clad with pink brink. Interior built with bar joists to provide clear spans without load-bearing walls and allow partitions to move freely. Main drafting room’s row of north-facing windows provide ample natural light. 1953: South Dakota congressional Conference office remodel, Huron. 1953: Cinemascope screen at the Hollywood Theater in downtown Sioux Falls. 1953: Lowell Hanson residence alterations, Sioux Falls. 1955: Madison School and McKinley addition, Huron. 1955-1958: $1.7 million McKennan Hospital addition and remodel, Sioux Falls. 1956: Salem-Zion Mennonite Church, Freeman. 1956: KELO TV Studio Building, Sioux Falls. 1956: Howard Wood Field, Sioux Falls. 1956: Day County Hospital, Webster. 1957: Hanel Motor Hotel, Minneapolis, MN. 1957: Commission for Watertown High School. 1957: Sioux Valley Nurses’ Dormitory, Sioux Falls. 1957: Commission for Luther Manor Home, Sioux Falls. 1957: Commission for College of St. Thomas men’s dormitory, St. Paul, MN. 1957: Commission for Augustana University Commons (Morrison Commons), Sioux Falls. 1957: Western Surety Building, Sioux Falls. 1957: St. John’s Nurses Hume, Huron. 1957: Bureau of Indian Affairs Hospital, Pine Ridge. 1957-1958: First Presbyterian Church, Sioux Falls. Designed by firm partner Wallace Steele. Tent-shaped nave to seat 500. Chancel wall features a ceramic mosaic by Palmer Eide (Augie). The mosaic’s symbols depict events in the life of Christ. Chapel’s ceiling slants behind alter to meet a grooved wood screen, and staggered slot windows pierce an unfinished brick wall. Won a Merit Award 1960 from the National Council of Churches of Christ. 1957-1959: Our Savior’s Lutheran Church, at 33rd Street directly south of Augustana University in Sioux Falls. Designed by firm partner William Bentzinger as a tan brick rectangle with a narrow bell tower. Seating for 1,020 including nave, chapel, and narthex. Chancel wall with oil mural of Christ and the Apostles. Exterior chapel wall covered with mosaic tile cross and heart by ceramist Carol Janeway. Soaring oil mural of the Ascension on white brick chancel wall by Robert Aldern (Augie). Won a Merit Award 1960 from the National Council of Churches of Christ. 1957-1962: Mount Rushmore Visitors Center, at the foot of the mountain near Keystone. In collaboration with National Park Service and Cecil Doty. 1958: First Congregational Church, Rapid City. 1958: Suburban Lanes, Sioux Falls. 1958-1960: South Dakota State Penitentiary West Cell Block, Sioux Falls. 1958: Spitznagel’s firm commissioned to lead development of a master plan for the proposed Sioux Falls Arena and Convention Center. 1959: Augustana University Commons Building (Morrison Commons). 1959: Naval Reserve Center, Sioux Falls. 1959: High School, LeMars, IA. 1959-1961: Commission, construction, and completion of Sioux Falls Arena. Interior plan strongly resembles the Huron Arena. Octagonal structure seats 9,550 for basketball games. Curving roof line follows descending rows of seats, which offer a combination of permanent chair seating and bleachers. The design eliminates corner seats that would afford reduced sightlines. 1960: University of South Dakota Science Center, Vermillion. 1962: University of South Dakota I.D. Weeks Library, Vermillion. 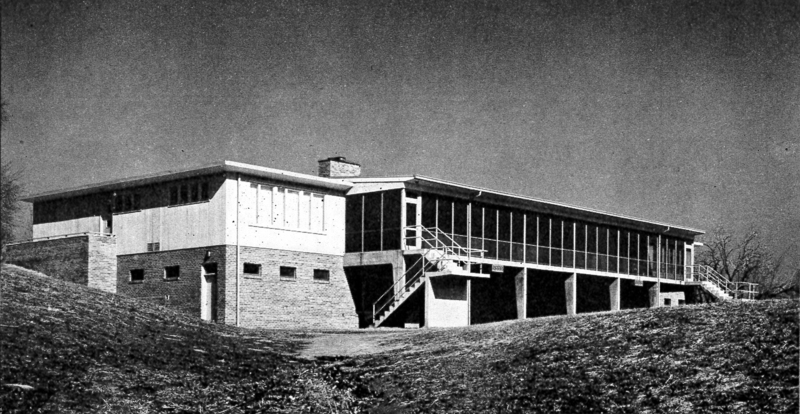 1962: Washington School addition, Huron. 1962: Senior High School, Huron. 1962-1966: Jehovah Evangelical Lutheran Church, St. Paul, MN. Several works by Palmer Eide, including figures of Christ in wood sculpture, sandcast chapel wall, wood door pulls, baptismal sculpture. Won a First Honor Award 1966 from the South Dakota Chapter AIA. 1963: University of South Dakota Student Union, Vermillion. Later renamed the CSC, or Coyote Student Center. Won an Honorable Mention 1965 from the South Dakota AIA. 1963: Minnehaha Country Club, Sioux Falls. 1963: National Bank of South Dakota, Sioux Falls. 1963: Great Plains Zoo and Delbridge Museum of Natural History, Sioux Falls. 1963: Eastway Bowling Center, Sioux Falls. 1964: Lincoln Senior High School, Sioux Falls. 1964: First Lutheran Church, St. Peter, MN. Bas-relief in brick sanctuary wall by noted liturgical artist Robert Aldern. Won a First Honor Award 1968 from the AIA South Dakota Chapter. 1964-1965: Augustana University Gilbert Science Center, Sioux Falls. Foucault pendulum over a mosaic floor compass by Marjorie Kreilick. 1964-1966: American College Testing (ACT) Program headquarters, Iowa City, IA. Cherry wood sculpture by Palmer Eide. 1965-1969: Research, planning, design, and construction of the Chapel in the Hills, a replica of Norway’s all-wooden Borgund Stavkirke, to stand just southwest of Canyon Lake in Rapid City. The original dates to around 1150. Members of the local Trinity Lutheran congregation—a builder and a main benefactor—were the driving forces behind the project, which was commissioned by the nonprofit Lutheran Vespers (a radio arm of the American Lutheran Church). Firm partner William Bentzinger designed the replica after he and his wife, Lovella, traveled to Norway to research such churches. He returned with blueprints for the Borgund church (graciously provided by the Norwegian Department of Antiquities). Built by Dilly Construction Company of Douglas fir, shipped from Oregon. Exterior and interior carvings made in Norway and on site. 1965-69: Planning, design, and construction of Holy Name Catholic Church, Watertown. Won a First Honor Award 1970 from AIA South Dakota Chapter. 1966-67: First Federal Savings and Loan, Sioux Falls. Won a First Honor Award 1968 from the South Dakota Chapter AIA. This later was the Howalt+McDowell Insurance office and site of the United Way fundraising thermometer on the rotating sign, at the corner of Minnesota Avenue and 11th It now is occupied by Bank Midwest. 1966: Madison School addition, Huron. 1966-1971: University of South Dakota Fine Arts Center, Vermillion. 1967-1969: National Action Council of Urban America, Inc.
1969: HUD Elderly Housing, Pipestone, MN. 1969: South Dakota State University Rotunda, Brookings. Home of the Arts and Sciences/Home Economics & Nursing programs. 1970: Commission for a Phase II addition to McKennan Hospital, Sioux Falls. In association with CRS Architects of Houston. Largest commission to date for the firm ($12.9 million construction cost). 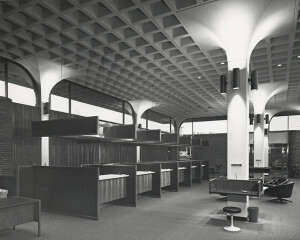 1970: Federal Office Building, Aberdeen. Joint project with local architects Herges Kirchgasler and Associates. 1970: HUD Elderly Housing two-story building, Mitchell. 1970-1973: Design, construction, and completion of South Dakota State University HPER Center, officially named for Stanley J. Marshall, who served as athletic director from 1965 to 1980. The arena within is named for Jack Frost, athletic director and head of the physical education department from 1947 to 1960. 1971: Earth Resources Observation Systems (EROS) Data Center, near Garretson. Firm later would complete a new building for EROS, in 1996. 1972: Commission to design Sioux Falls’ downtown pedestrian mall, which closed Phillips Avenue to car traffic. 1972: Edison Junior High School addition, Sioux Falls. 1972: Minnehaha County Public Safety Building, Sioux Falls. Learn more about Harold Spitznagel and the firm he started in the Summer 2016 edition of architecture SD magazine. Got a Spitz story to share? Click to write your story and share your photos, we'd love to hear from you!